On arrival we were upgraded to a larger apartment. Extra large bed and very comfortable. Great location in a quiet area but close to the beach and restaurants. Comfortable bed, good kitchen facility, nice pool and bbq area, great car parking. Close to all the amenities, shops, restaurants and beach. the resort was very peaceful and relaxing. It was only an overnight stay so it was all we needed. The receptionist walked us to our room. It was very close to the underground car park. The bed is big and comfortable. The resort was peaceful and away from the busy esplanade at Palm Cove. The apartments are located slightly away from the busy Main Street, so it was quiet and relaxing. The pool area was like an oasis, shady both in the morning and the afternoon. This was my second stay. I would go there again. The apartments are a little older than other complexes, but that did not bother me because I was there to relax by the pool and enjoy all that Palm Cove had to offer. Everything was fine. Very clean room and good service from reception. Very quiet area with good separation from other units. Cleanliness and location. Good bed, average pillows. Comfortable overall. I would stay again. 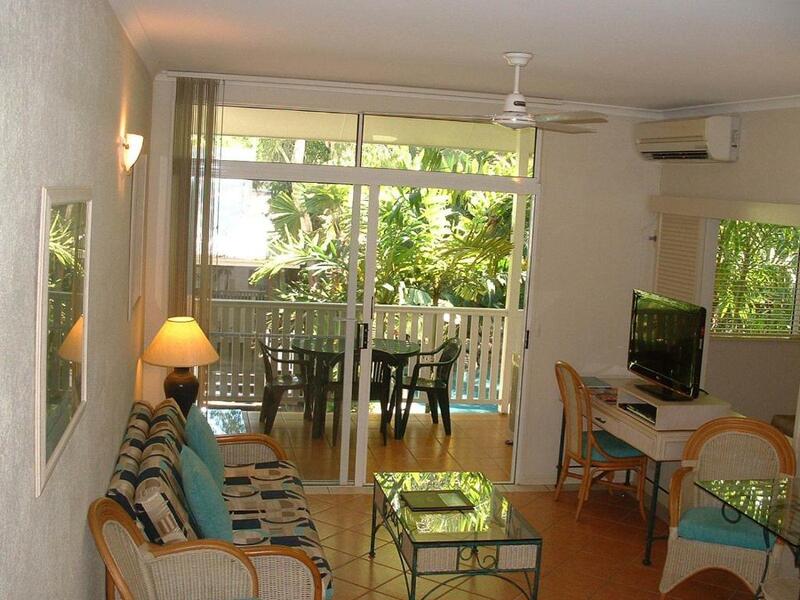 Lock in a great price for Palm Cove Tropic Apartments – rated 8.8 by recent guests! 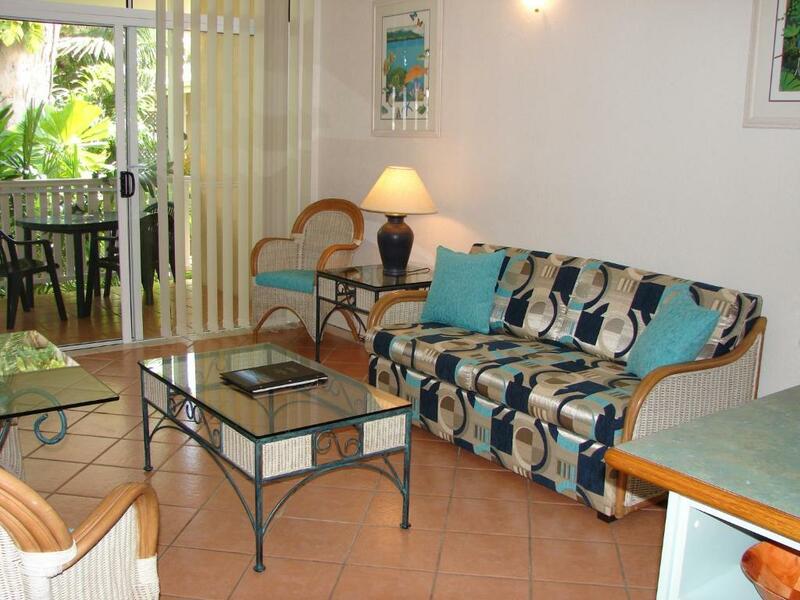 Palm Cove Tropic Apartments This rating is a reflection of how the property compares to the industry standard when it comes to price, facilities and services available. It's based on a self-evaluation by the property. Use this rating to help choose your stay! 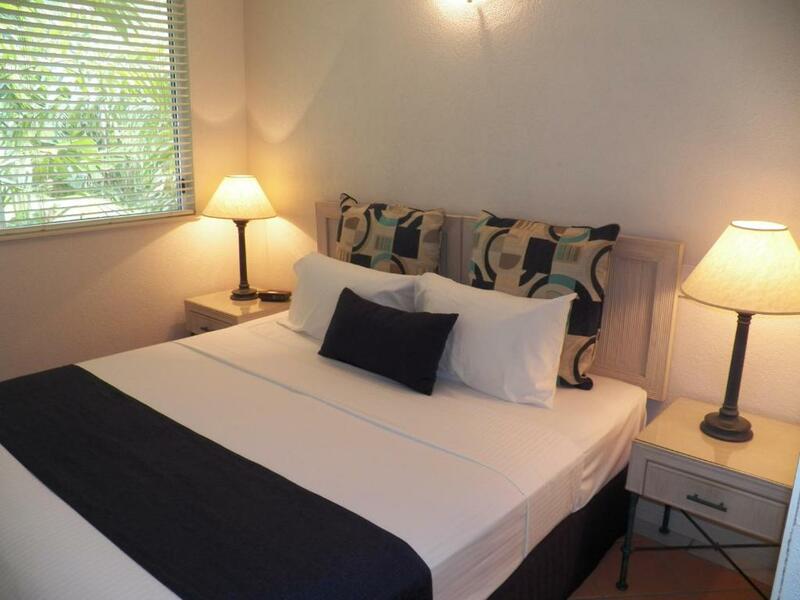 Located 300 feet from pristine Cairns beaches, the Palm Cove Tropic Apartments is just a short walk from many of Cairns’s world class restaurants and cafes. Free WiFi is available. 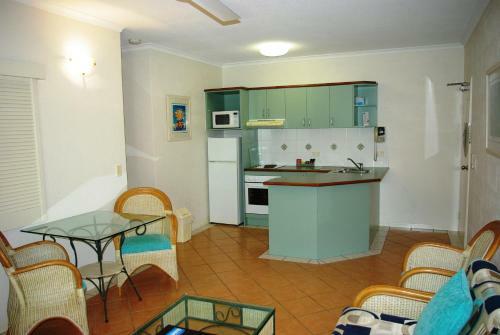 All apartments at Palm Cove Tropic are self-contained with separate bedrooms, lounge areas, dining rooms and full-kitchen facilities. 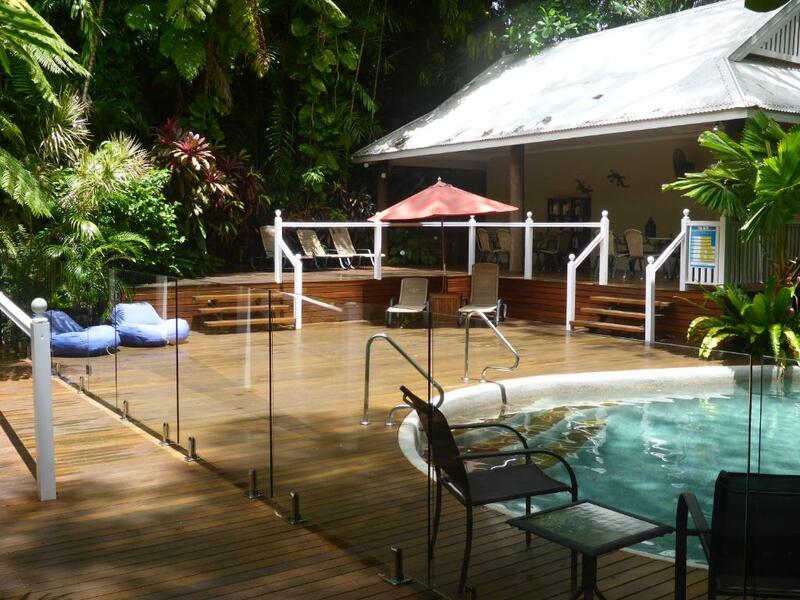 All rooms also include spacious balconies or patios overlooking the rainforests, pool or garden area. Palm Cove Tropic facilities include a swimming pool, which is heated in winter, a terrace with deck chairs, and a covered barbecue area for outdoor picnics. Palm Cove Tropic Apartments is located 25 miles north of Cairns city center and Cairns International Airport. Free private parking is available. When would you like to stay at Palm Cove Tropic Apartments? Please note if an alternate bedding configuration is required, there is an additional charge of AUD $25. Airport transfers are available at a fee of $25.00 per person each way. 48 Hours advance notice is required to book these transfers. Please contact the property direct for further information using the contact details found on the booking confirmation. Please note that the rates are based on 4 guests. Maximum occupancy is 5 (see Hotel Policies). This more spacious apartment features a larger living area and a fully equipped kitchen with a large fridge. It offers pool views, a separate laundry and a separate toilet. 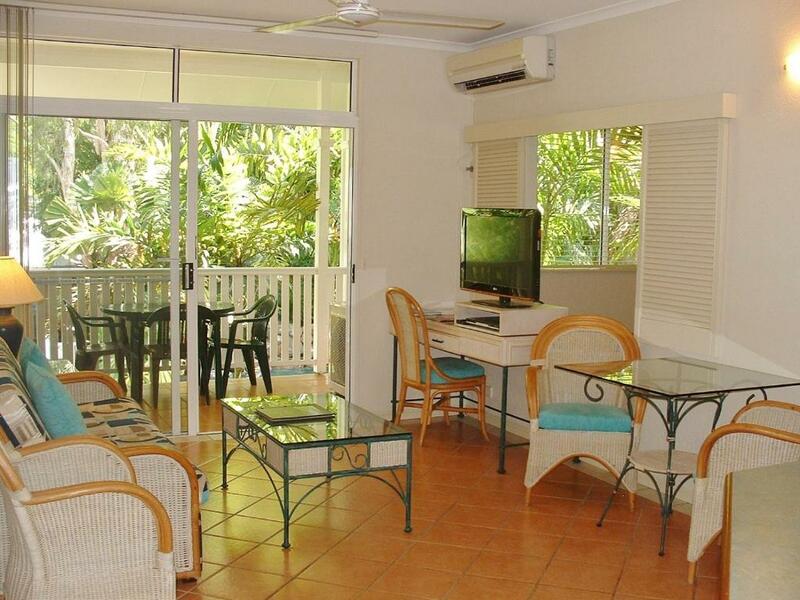 Palm Cove Tropic Apartments offers high quality but affordable accommodation in Palm Cove. Our self contained, 4 Diamond accommodation features 1 and 2 bedroom holiday apartments. The well-equipped accommodation has kitchens, laundry facilities, king beds, flat screen LCD TV’s, and spacious balconies. Set in tropical landscaped gardens, our resort facilities include a free-form swimming pool (heated in winter), sun decks with deck chairs, covered BBQ and dining area. We also have a tour office with a free booking service. A day spa is located on-site and offers discounts to guests. Free WiFi is available to all guests (reasonable use applies). Palm Cove Tropic Apartments Management Rights owners are Wayne & Scott, they live on-site and are here to help their guests anytime. Wayne & Scott have been in the Hospitality Business for many years and have an extensive knowledge of the Local Area and what makes for a unique holiday, they can book tours from their Tour Desk facility, they don't charge a booking fee, this is a FREE service for their lovely guests. It is always best to leave any tour bookings until you have checked in because a lot of the tours are weather permitting, Wayne & Scott can then inform you on which tours are best to either suit the weather conditions or the guest. Please take advantage of their LOCAL KNOWLEDGE. 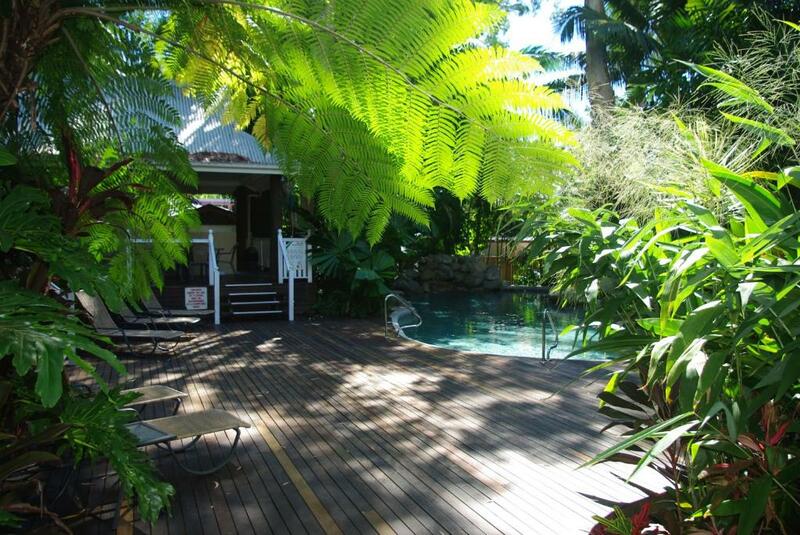 The picturesque village of Palm Cove, just 20 minutes north of Cairns International Airport, is surrounded by a palm fringed sandy beach nestled against a tropical backdrop of rainforest covered mountains. Palm Cove is the ultimate lifestyle and holiday destination. 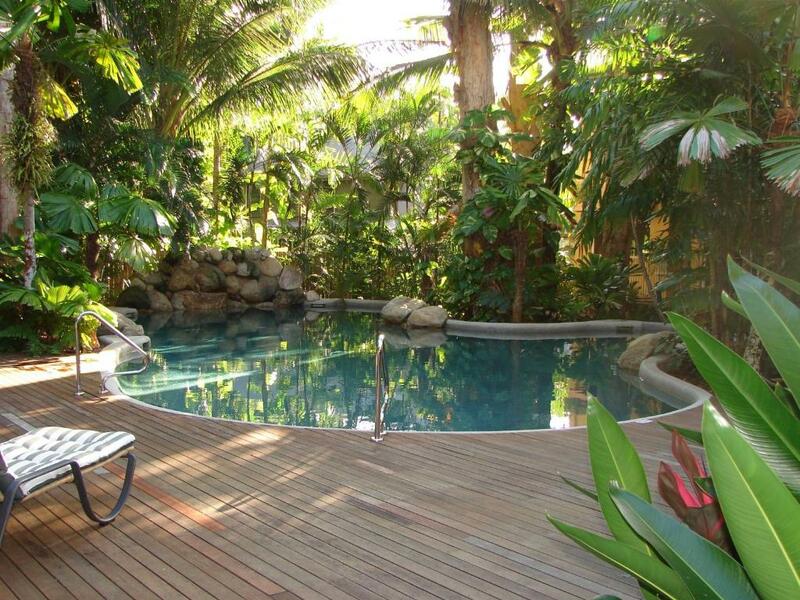 Palm Cove is the most beautiful of Cairns’ Northern Beaches with a rainforest backdrop and views to Double Island. It is an ideal base from which to visit the Great Barrier Reef and the spectacular world heritage listed Far North Queensland rainforests. Popular attractions, including Kuranda, Atherton Tablelands and Port Douglas are within easy reach of our Palm Cove resort. Tropical North Queensland is a great destination all year round. House Rules Palm Cove Tropic Apartments takes special requests – add in the next step! All children under 2 years are charged AUD 11 per night in a crib. Palm Cove Tropic Apartments accepts these cards and reserves the right to temporarily hold an amount prior to arrival. Please inform Palm Cove Tropic Apartments of your expected arrival time in advance. You can use the Special Requests box when booking, or contact the property directly using the contact details in your confirmation. Very spacious, well equipped and clean. nothing to complain about, excellent facility. The airconditioner is in the living area so the bedroom was quite hot. It had a ceiling fan but would be nice to feel more of the airconditioner in the bedroom on a very hot summer day. The fire alarm kept beeping. We wanted to address this at reception soon after we checked in at about 3pm but reception had closed. No tissue box supplied as amenities are very basic. Very limited TV channels too. Everything .clean .great location .. Pool needs cleaning every day in my opinion because of all the debris from the plants. Being in a with stairs with a baby. Had to ensure the balcony door was locked at all times.